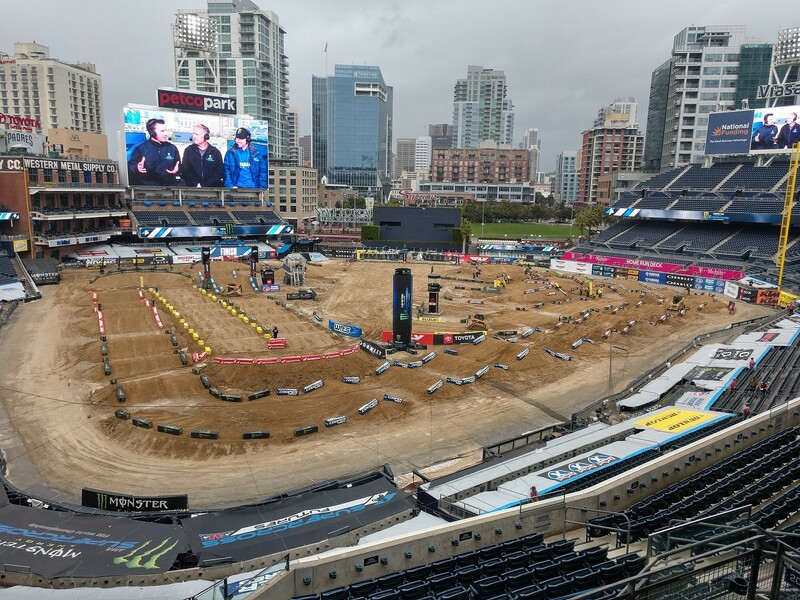 Welcome to the Racer X Race Day Feed, coming to you from Petco Park in San Diego, California. 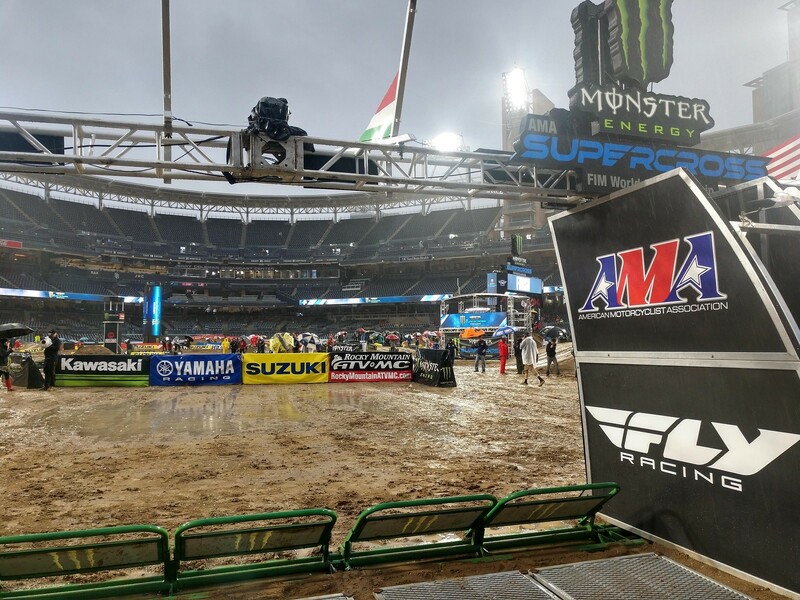 From practice reports to the blow-by-blow from tonight’s program, you’ll find it all right here on the Racer X Race Day Feed. Updates are posted in chronological order, so be sure to scroll down for the latest info. For even more updates be sure to follow us on Twitter, @Racerxonline. If it seems like the Race Day Feed is getting a late start today, well, that’s because it is. 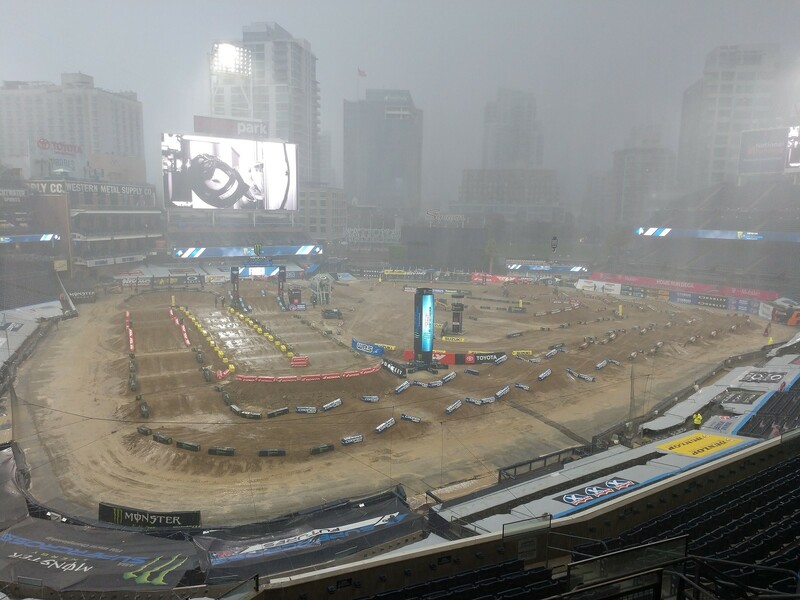 We’re on a delayed schedule here in San Diego thanks to wet weather. As of noon it wasn’t raining but plenty of rain has already fallen in the last few days and much more is expected this afternoon. As a result the track is covered, and track walk, which normally starts at 10:30 in the morning, isn’t scheduled to take place until 3:45. Practice and qualifying are cut to one session and won’t get underway until 4:45. It’s definitely going to be sloppy tonight, which has the potential to really shake up what’s already been a totally unpredictable season. Speaking of unpredictable, did anyone think at this point reigning champ Jason Anderson be out of the season and Cooper Webb would have more wins than anyone else and be the championship leader? Probably not. Nobody thought it’d be this close, either. 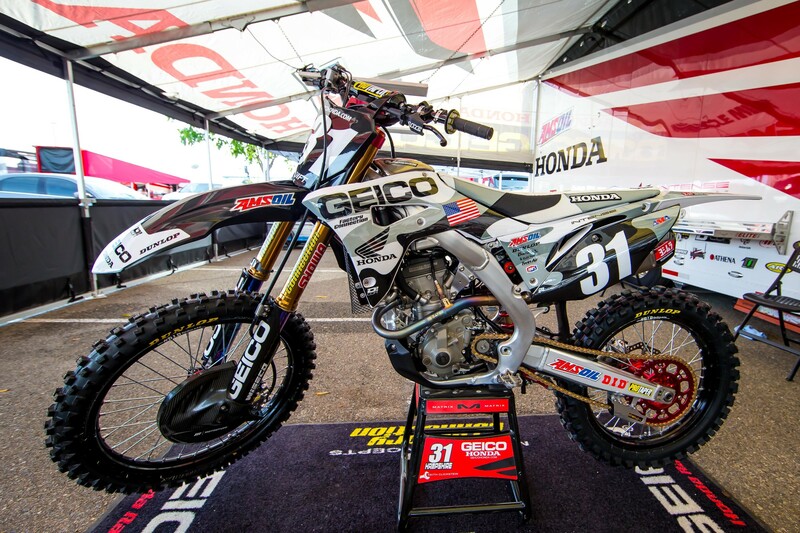 The top four, Webb, Ken Roczen, Eli Tomac, and Marvin Musquin, are only separated by four points. That’s closer than any season, after four rounds, in the history of the sport. Enjoy it now folks, it might not be like this all season! As close as the championship is right now, it’s not the only thing happening. 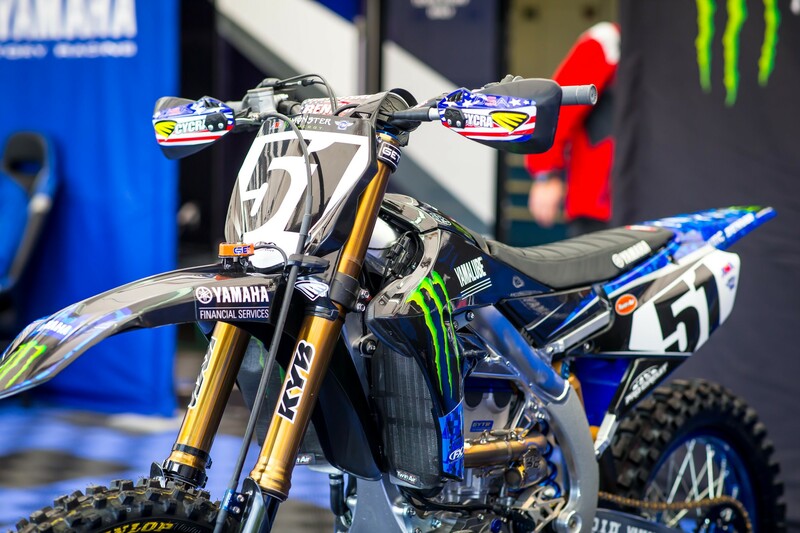 Justin Barcia is still riding with a sore tailbone due to a crash at Anaheim 2 and Ben LaMay is coming back after hurting his leg in practice in Oakland. We also spoke with Anderson yesterday and learned his injuries are a little more extensive than initially reported. In addition to his broken arm and rib (which turned out to be ribs), he also suffered a collapsed lung, lacerated his liver, and “had broken some stuff in [his] back” too. 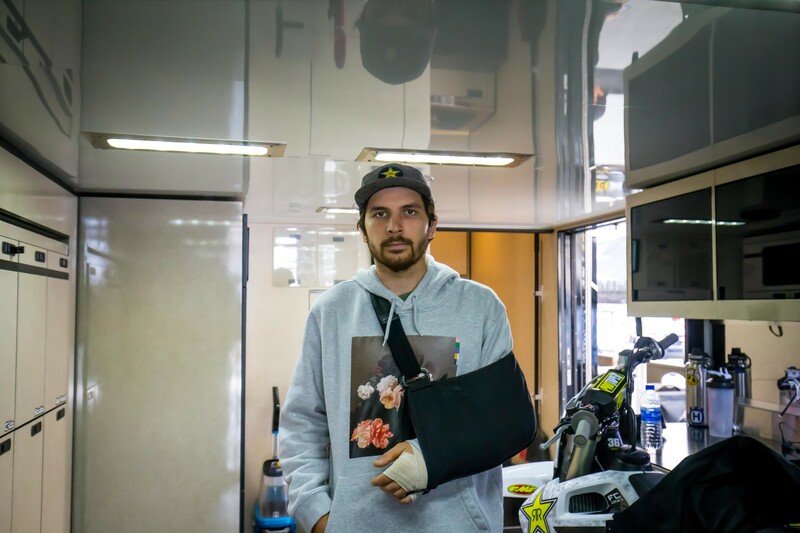 Not surprisingly, he doesn’t think he’ll be back racing before the end of the season. 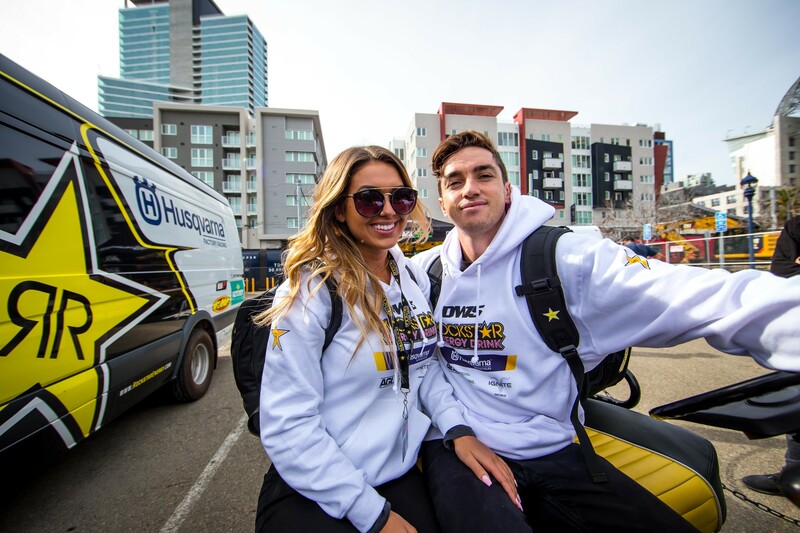 He didn’t rule it out, but said right now it makes more sense to focus on being solid for Lucas Oil Pro Motocross than to try to rush back for a few races at the very end. Look for the interview in its entirety next week. For the complete report on who's in and who's out tonight, go here. 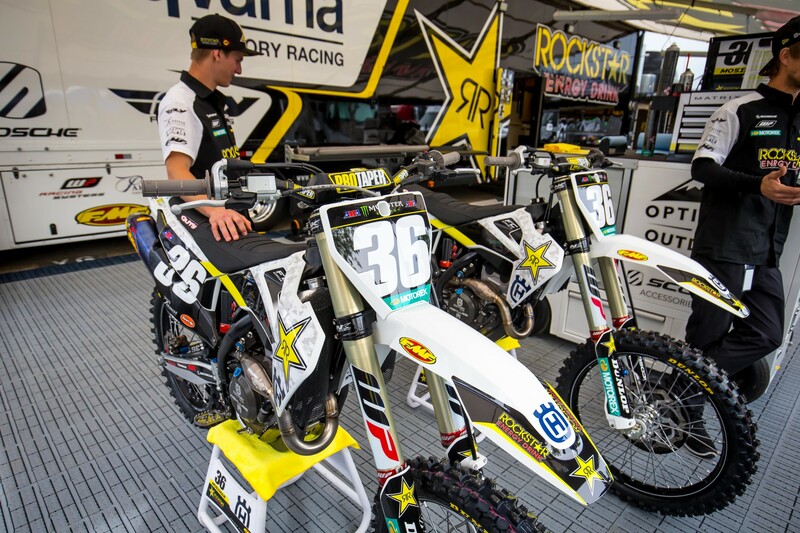 Elsewhere in the 450SX Class, Matt Bisceglia and Cycle Trader/Rock River/ Yamaha have parted ways. In Bisceglia’s place now is Ryan Breece, who’s in the midst of his first 450SX season. We spoke with him yesterday and he’s excited to be part of the team. He was already on a Yamaha and uses Enzo suspension, just like Cycle Trader/Rock River/Yamaha does, so the transition shouldn’t be too crazy. He even got a chance to ride the bike two days earlier this week. In the 250SX Class the points situation is also pretty tight. 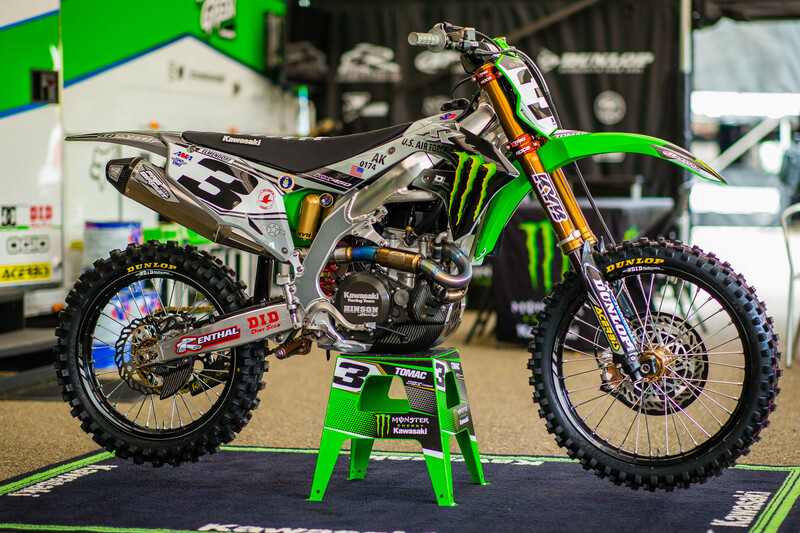 The top four, Colt Nichols, Adam Cianciarulo, Shane McElrath, and Dylan Ferrandis, are separated by just five points. RJ Hampshire is fifth, but thanks to a disastrous main event last week, in which he crashed four times, Hampshire sits twenty-four points out of the lead. That doesn’t mean he hasn’t been riding well, but for the most part he's struggled with starts. Check out this interview we did with him yesterday for more info. It took longer than expected, but just after three o'clock the rain finally started coming. The timing was such that it happened right after the tarps had been pulled off the track. It wasn't coming down hard at first, but then it absolutely dumped buckets and completely soaked the track. It's also pretty windy and a few easy-ups in the pits got mangled. 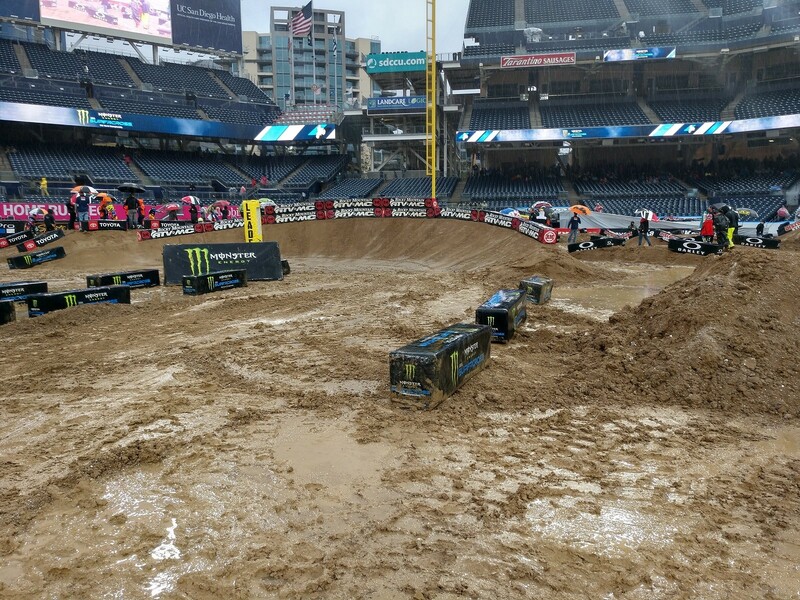 The good thing is the track crew has plenty of experience with rain, and if there's a way to keep this track in any sort of racing shape, you can be sure they'll get it done. Track walk is set to commence soon so stay tuned for updates. 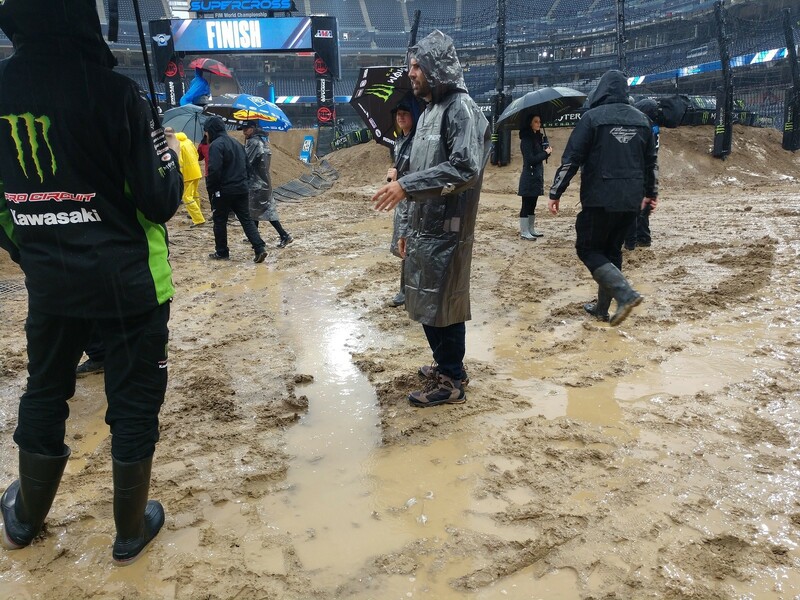 Track walk is over and it's official, it's extremely soft and muddy out there. All through track walk rain fell and is expected to continue to do so for the next few hours. The track crew is working to do what they can to salvage the racing surface but there's only so much they can do when the rain doesn't stop. Walking on the track was an interesting experience. In places the dirt actually felt firm, but in the next step your boot would sink down several inches, requiring significant effort to pull it back out. 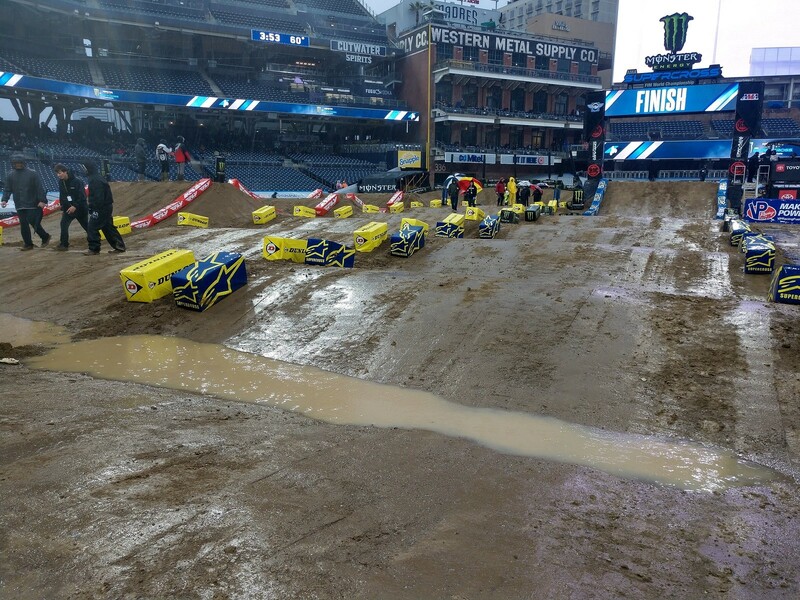 The whoops are tamed down for the weather, but there's still plenty of water pooled between them. Should make for a wild night! 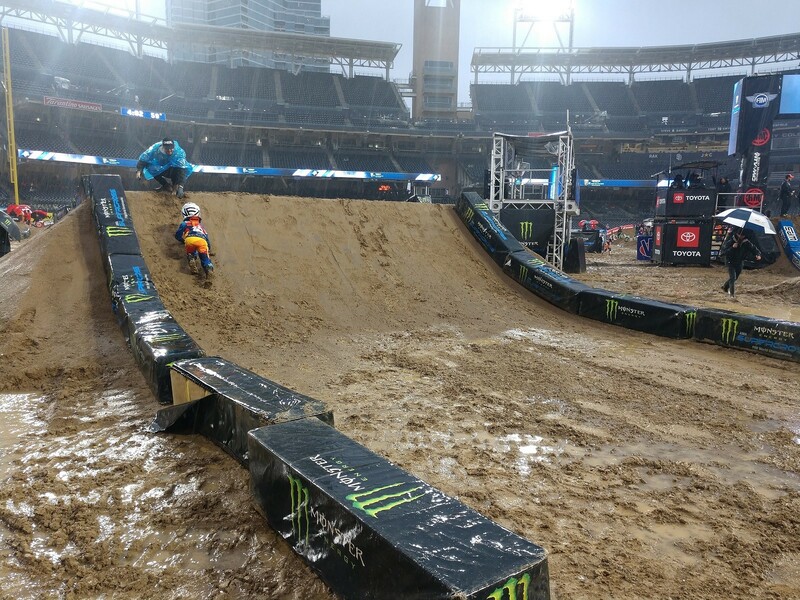 As expected, practice was a slippery affair, with plenty of riders going down all over the place and getting up completely covered in mud. It got slicker as qualifying wore on too thanks to steady rainfall. At the start of the 250SX A practice Martin Castelo and Adam Cianciarulo got into each other and went down. It took them several moments to get going too, as their bikes had gotten tangled up. At the top of the board was Shane McElrath, who set a 59.139 almost right away. It was quick enough to hold up too, although Dylan Ferrandis came close to taking the top spot when he busted out a 59.256. Ferrandis and McElrath were the only two riders to dip under a minute. In 450SX action it was Aaron Plessinger who set the fastest time at first. It didn’t take long for him to beat his own time, but then Vince Friese took over the top spot. Just Barcia took his turn on top next with a 1:01.925, followed by Eli Tomac with a 1:00.182. Cooper Webb came next when he dipped into the 59-second range with a 59.937, then beat is own time with a 59.898. Tomac responded at the very end though by throwing down a 58.636 to become the fastest qualifier of the night. Rain fell the entire time and there’s standing water all over the place. There's quite a bit on the straightaway, and jets of water were getting blasted into the air when the guys sped through. It’s not as bad as it could be though, and plenty of the jumps, including a triple and a few rhythm combinations, are still getting launched. 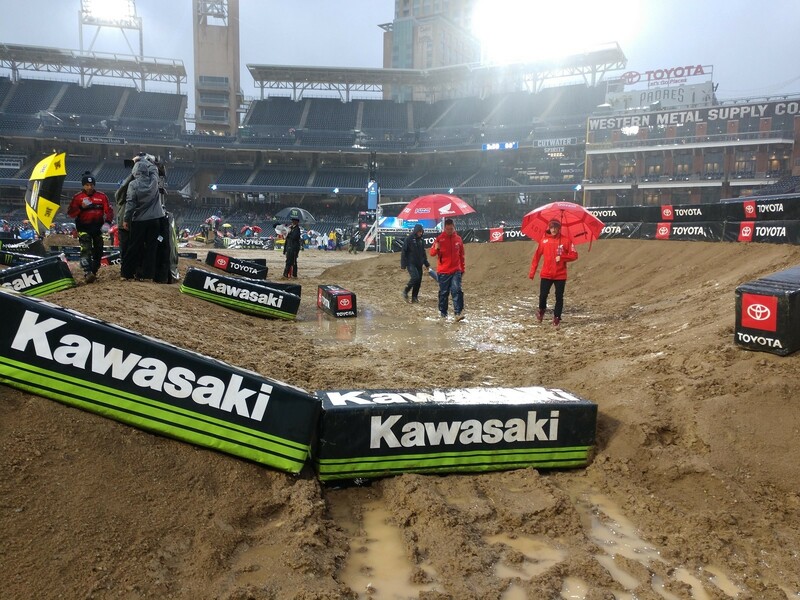 It's pretty sloppy out there and there are already huge ruts, but if it doesn't get any worse the track will still be somewhat raceable. That's it for qualifying, as rain prompted organizers to cut practice/qualifying to just one session. The first race of the night kicked off with a massive display of mud and water blasting into the air as the guys rocketed off the line. Multiple riders went down, while those not up front were frantically yanking on their roll-off strings. Dylan Ferrandis was able to beat everyone to the front and immediately tried to check out. Behind him Jerry Robin went down hard on the first lap, handing second to Adam Cianciarulo, who went after Ferrandis. He slowly inched closer the entire time and on the last lap it looked like he might be able to make something happen. He couldn’t quite get close enough though, and he finished behind Ferrandis by less than a second. Ferrandis, Cianciarulo, Enzo Lopes, Cameron McAdoo, Martin Castelo, Chris Blose, Jacob Hayes, RJ Wageman, and Ludovic Macler all transferred to the main. Colt Nichols and RJ Hampmshire were side by side on the start of this one, but Hampshire owned the spot after the second turn. Behind them multiple riders had gone down on the start stretch again, and everyone was so covered in mud it was almost impossible to tell who anyone was. Up front Hampshire was getting away. Nichols held third, with, Jimmy Decotis, Jess Pettis, and Carson Brown rounding out the top five. As the race wore on Nichols started cutting into Hampshire’s lead and got pretty close on the last two laps. On the last lap he needed a good run through the whoops to get Hampshire but Hampshire went through them too fast to lose any ground. Pettis and Decotis swapped third a few times in this one before Decotis took over the spot for good. Hampshire, Nichols, Decotis, Pettis, Brown, Michael Mosiman, Mitchell Harrison, Devin Harriman, and Scott Champion all transferred to the main. Shane McElrath had some sort of problem in this one and got lapped. He’ll head to the LCQ. Amazingly no riders ended up on the ground on the start in this one, although a few did end up stalling on the start stretch. Up front Ken Roczen led with Blake Baggett and Joey Savatgy giving chase. Baggett ended up fading back a bit, losing spots to Cooper Webb, Justin Barcia, and Cole Martinez. Baggett eventually repassed Martinez. Up front Roczen had pretty much disappeared, and Webb had hunted down Savatgy to take over second. When the checkers flew it was Roczen, Webb, Savatgy, Barcia, Baggett, Martinez, Tyler Bowers, Dean Wilson, and Cade Autenrieth who were in transfer spots. Aaron Plessinger kicked this one off with a holeshot but Justin Bogle was all over him and took over the lead several turns into it. Kyle Chisholm ran third, with Eli Tomac in fourth. Tomac nearly had a tip over in the whoops but managed to save it. Cole Seely was way back in the early stages of this one but he didn’t take long to start moving up and had moved into qualifying position fairly quickly. Up front the crowd gasped when Justin Bogle went down all by himself. His lead was so big he didn’t lose any time, but a couple turns later he went down again, giving the lead back to Plessinger. Musquin also went down while running fifth but stayed in qualifying position. Late in the race Tomac had caught Plessinger and the two went at it for the lead. Tomac would end up taking the position and the crowd erupted, making more noise than they’d made all night. Justin Hill was supposed to be in this race but didn’t line up. We’re hearing he had some kind of problem during practice but we haven’t been able to confirm anything yet. Tomac, Plessinger, Musquin, Chisholm, Bogle, Heath Harrison, Chad Reed, Vince Friese, and Cole Seely transferred to the main. Garrett Marchbanks got the holeshot in this one, and it was a good thing for him—there was a massive pileup in the third turn involving a ton of guys. 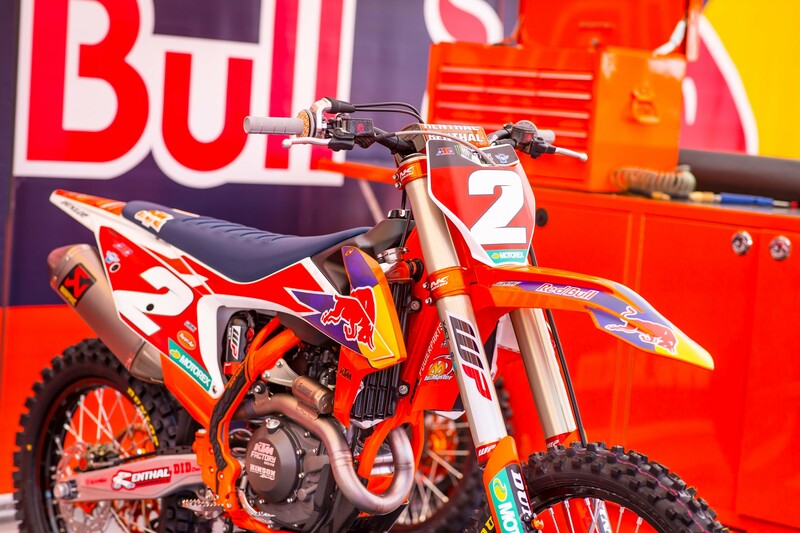 Shane McElrath was able to avoid it as well and rode all by himself in second place, ten seconds back of Marchbanks and twenty-five seconds ahead of Deegan Vonlosserg in third. That margin would increase as the race wore on. Chris Howell ran fourth but Sean Cantrell was trying to run him down on the final lap. Cantrell ended up crashing though, and the battle was over before it even started. Marchbanks, McElrath, Vonlossberg, and Howell took the final 250SX transfer spots of the night. Ben LaMay nabbed the holeshot and started checking out right away. Carlen Gardner ran second, with Cheyenne Harmon and Theodore Pauli holding the final transfer spots. Then Harmon went down all by himself and dropped out of qualifying position. That put Alex Ray in fourth. Later Gardner had problems but was able to recover and get back into fourth. LaMay, Pauli, Ray, and Gardner all transferred to the main. The first main event of the night saw Colt Nichols streaking into turn one first, but it was Adam Cianciarulo who came out of it with the lead. Nichols held second but spun out in the whoops and lost a ton of time. The rest of the race wasn't much better and he eventually ended up in tenth. After two laps Adam Cianciarulo had about ten seconds on Jess Pettis in second, who was under fire from Dylan Ferrandis and Garrett Marchbanks. They both eventually passed Pettis, who then lost another spot to Jimmy Decotis. Pettis then crashed all by himself but didn’t lose any positions. 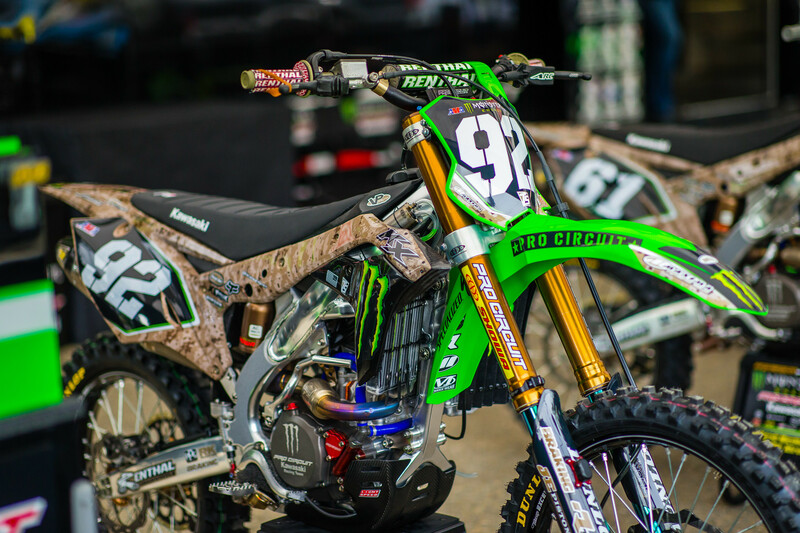 Up front Cianciarulo was gone, and his teammate, Marchbanks, had taken displaced Ferrandis for second. Then things went terribly for Ferrandis. 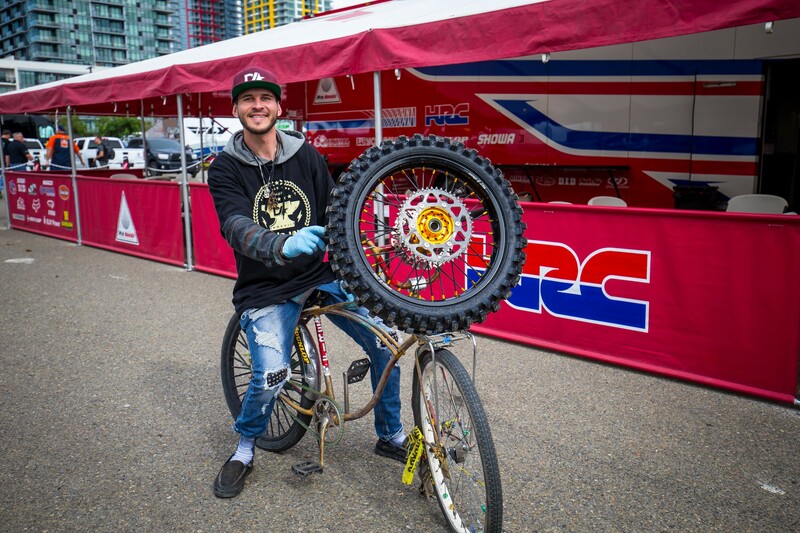 His bike started smoking and a mechanical problem prevented him from finishing. Fortunately for Ferrandis he’d lapped so far up that he was still credited with seventh. Not what he wanted after running third, but it’s better than what it could have been. This race was pretty chaotic. It would probably be a shorter list if you listed all the guys who didn’t crash. There were guys down all over the place all race long, and everyone was so covered in mud it was tough to tell who was who at times! Ken Roczen came out of the first turn with the lead, but then went down in the following section. That handed the lead to Eli Tomac with Justin Bogle and Justin Barcia following. Roczen, meanwhile, had recovered quickly and was running fourth, just a bit behind Barcia, who’d lost touch with Tomac and Bogle up front. 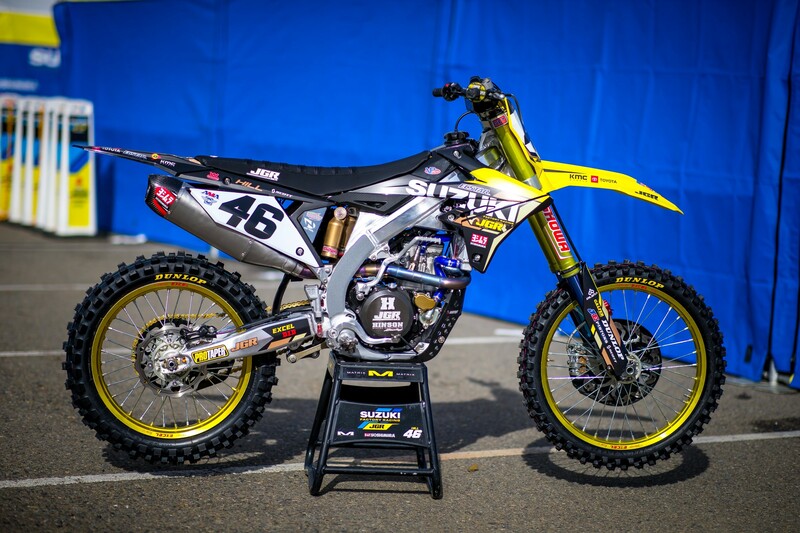 Then Barcia’s bike developed a problem and just like that, he was out of the race. Up front Tomac had broken away and had a good lead on Bogle, who was all by himself in second. He even fell and had time to remount without losing any spots. There wasn’t a whole lot of battling going on anywhere, as the track was in such poor shape most guys were simply trying to survive. 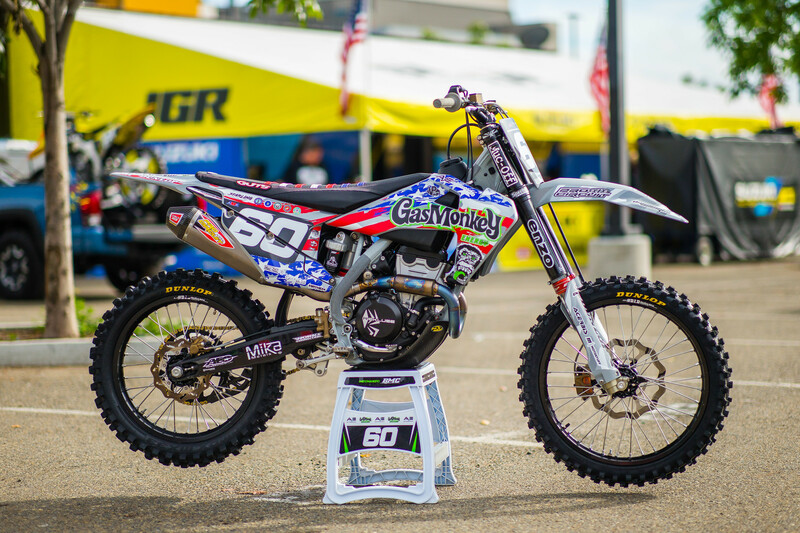 Chad Reed was the exception though. He was making moves and was able to pick up a few spots as the race continued. With a few minutes remaining Bogle went down again and lost a spot to Roczen. 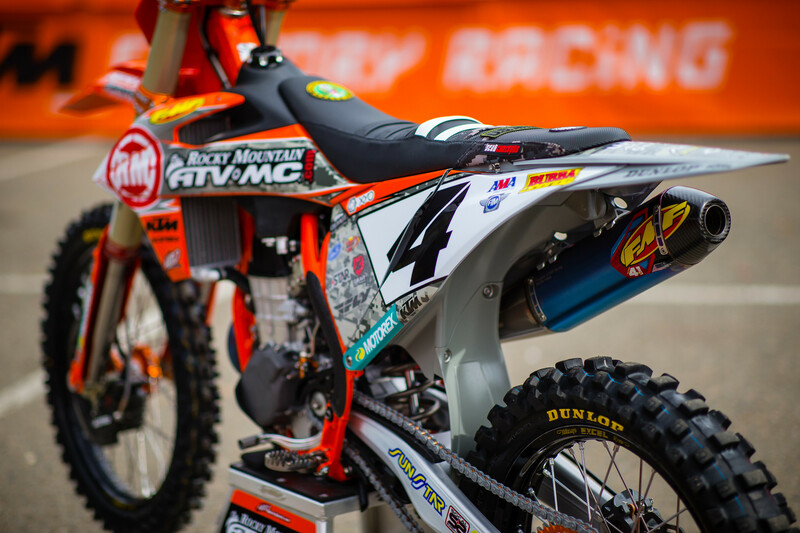 He was able to remount and stay in third, but Marvin Musquin eventually got him. Up front, meanwhile, Tomac went down in a lefthander. Fortunately for him he’d built a large lead and was able to get going again long before anyone even got close. Tomac went on to win, despite some sketchy moments on the last lap that allowed Musquin, who’d taken over second, and Roczen to close significantly. Bogle ended up fourth, and Reed took fifth.